Providing you the best range of scarlox anti scar lotion, silkysoft lotion, caleo-z lotion, sertacare lotion, anti scar lotion and scarwel anti scar lotion with effective & timely delivery. 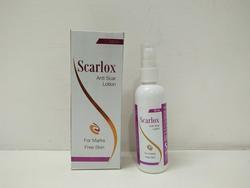 We are offering Scarlox Anti Scar Lotion to our clients. Emulsifying Wax,Glyceryl Mono Stearate,Cetyl Alcohol,Cetyl Alcohol,Light Liquefied Paraffin,Propylene Glycol,Glycerine,Almond Oil,Sodium Acrylate Copolymer,Cyclo Penta Siloxane Dimethiconol,EDTA,DMDM Hydantoin,Polysorbate-80,Perfume,DM WaterEmulsifying Wax,Glyceryl Mono Stearate,Cetyl Alcohol,Cetyl Alcohol,Light Liquefied Paraffin,Propylene Glycol,Glycerine,Almond Oil,Sodium Acrylate Copolymer,Cyclo Penta Siloxane Dimethiconol,EDTA,DMDM Hydantoin,Polysorbate-80,Perfume,DM Water. We are offering Sertacare Lotion to our clients. We are offering Anti Scar Lotion to our clients. We are offering Scarwel Anti Scar Lotion to our clients.